College started early for 27 high school students set to attend the Portsmouth Campus this fall. 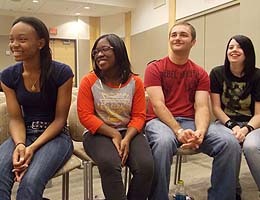 The Portsmouth Campus introduced TCC Express, a summer bridge program designed to bridge the gap between high school and college by providing students orientation to the campus environment; by educating students about campus and community resources; and by assisting students in building skills that will support them to degree completion. The week-long experience will culminate with speakers Nathan McCall and Kemba Smith. McCall, author of “Makes Me Wanna Holler,” is a Portsmouth native and a nationally renowned speaker. Smith, formerly convicted of a federal crime, heads her own foundation and is the author of “Poster Child.” Students will receive copies of both books and complete an assignment for the fall based on each. Provost Michelle Woodhouse said too often students attending the Portsmouth Campus directly from high school struggled with the transition. Many were first generation college students, who were unable to handle the early challenges of college life. “We were losing good kids that we shouldn’t have lost,” Woodhouse said. Dana Singleton, First Year Success manager on the Portsmouth Campus, said the college worked with the city’s public schools to identify incoming students. Students who complete the week will enter the fall with one credit hour – SDV 100 College Success Skills, paid for by Tidewater Community College – already under their belts. “We want them to leave as leaders,” Singleton said. The program started with a welcome dinner last week followed by five days of student-centered activities. Students participate in public speaking and team-building activities and learn test-taking strategies. Daily, the students reflect on what they learned during the previous session. Each day a different club will make a presentation; for example, the Fashion-Business club will focus on appropriate dress. Students will also participate in community service through the March of Dimes, and they will listen to a speaker from the Up Center whose topic is conflict resolution. Necessary placement tests will also be completed. The week will culminate with a going-away reception on Friday and remarks by McCall and Smith. Ideally, Singleton said, TCC Express will expand to several sessions and other campuses.